I bathed Alice again this week, and as always, it was quite the task. Most of the time it's a chore simply to catch her for a bath, but this time, Blue Heeler felt compelled to play in the bath water. It made The Rinse Cycle difficult. 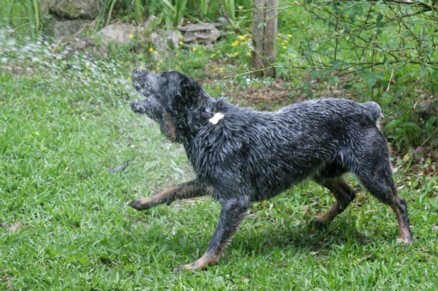 But as annoying as it was to have a Little Blue Dog bouncing into the spray, it got me to thinking about the biggest hurdle to bathing a Bloodhound - Montoya. Now for those of you who have ever considered getting a hound, you need to know that even on a good day, they stink. Even if you bathe them in rose-scented shampoo, they will still smell like wet bloodhounds (with a faint hint of rose). But poor Alice, like most bloodhounds in Texas, has skin allergies and must be bathed regularly. This is no thrill for me or for Alice. 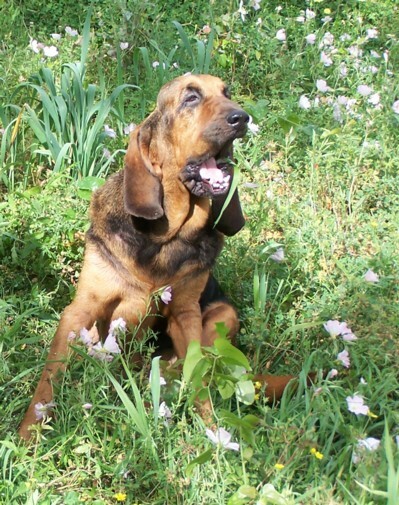 Bloodhounds come with an uncanny sense of smell. They also come equipped with an uncanny sense of knowing when the thought of a bath just flits across your mind. As soon as the thought enters my mind, Alice runs to hide in the pumphouse. Fortunately for me, cat food is Kryptonite for Bloodhounds, and if I pretend that I'm not holding a leash in my armpit, I can dump dry cat food on the barn floor and snare her as she's scarfing it up .... if I'm fast. Luck was with me, and I was able to catch my hound, pour a little Pantene Shampoo & Conditioner in a bucket, and hit it with the water hose. That's about the time things got interesting. Because Montoya spends so much time in the back yard, I tend to forget he's there. He's like Andalusian Yard Art. And he happens to be fascinated with bubbles. I did not know this until this afternoon. Neither did he. Montoya was delighted with the bucket of suds that I was sponging onto the hound. He hovered over us and supervised the entire operation. "Yep.... you need those to bathe Bloodhounds." "Why don't I ever get bubbles?" "Go away. Leave that alone." "I want BUBBLES! I want BUBBLES! I WANT BUBBLES! ......Whoops..."
"Happy now? Your bubbles are all over the ground." "Look! I have a Bubble Mustache!" "I'm not impressed. Go away!" "See my mustache? Look. Right here. See? Oh good! You're making more bubbles!" "Oooooh... there are bubbles on the DOG!" "Can I lick the bubbles off the dog!" I dropped the water hose. It squirted him. "Hey! I've got a Bubble Mustache. Do you see it?" By the time I was finished, the hound was soaked, I was soaked, and Montoya was soaked, but he proudly wore his Pantene Mustache until I wiped it off. I don't think the hound will ever come out of the pumphouse again. Please, pretty please--make sure Other Half is home (with a camera) the next time you bathe Alice! Bathing Alice is always a lesson in comedy!